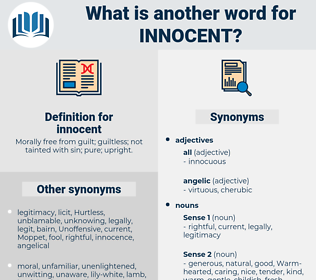 What is another word for innocent? Morally free from guilt; guiltless; not tainted with sin; pure; upright. 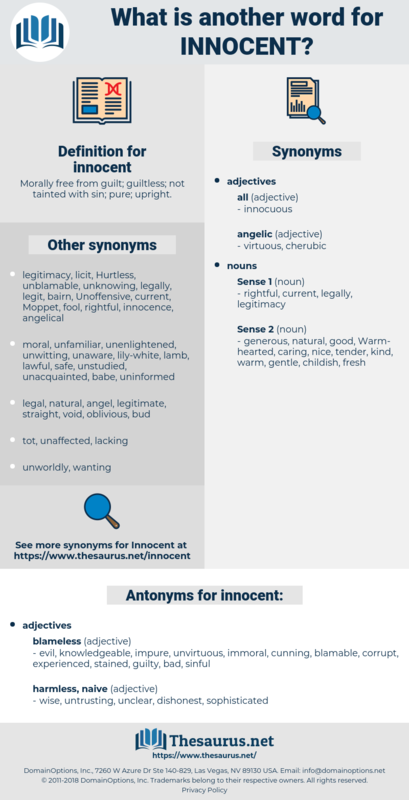 harmless, guilty, inoffensive, Kind-hearted, inadvertent, well-intentioned, honest, involuntary. innocuous, naive, ignorant, unsuspecting, defenceless. evil, knowledgeable, impure, unvirtuous, immoral, cunning, blamable, corrupt, experienced, stained, guilty, bad, sinful. wise, untrusting, unclear, dishonest, sophisticated. accused, wary, peccant, realistic, pretentious, cognizant, condemned, two-faced, careful, fake, unchaste, critical, ruinous, Lickerish, erring, shifty, degenerate, streetwise, underhanded, hypocritical, scathing, malignant, tainted, adroit, dissolute, manipulative, unhealthful, existing, down-to-earth, reprobate, hip, fatal, arch, intriguing, knavish, offensive, debased, forced, aware, leery, sinning, deceitful, knowing, Virtueless, unconvinced, lethal, unlawful, existent, mindful, debauched, pragmatic, flagitious, flattering, vile, crooked, strained, insincere, dissembling, mealymouthed, affected, taught, calculating, nefarious, depraved, damned, painful, polluted, phony, witting, acquainted, conversant, slippery, unwholesome, sinister, pestilent, artificial, felonious, polished, sensitive, sober, sycophantic, lost, educated, assuming, schooled, cultivated, illegal, nasty, insidious, unctuous, dissimulating, watchful, unsound, vicious, fallen, noisome, smooth, street smart, convicted, cautious, feigned, deceptive, guarded, abominable, observant, refined, perverted, diplomatic, sentient, false, wounding, deadly, heedful, civilized, venomous, hangdog, Grounded, poisonous, ominous, au courant, cultured, up-to-date. It looks innocent enough, doesn't it? If he is an innocent man, then he must be a foolish one.